Overall, Syria’s economic resilience can be attributed to three factors: its former economic measures, the role of political allies and the economic measures undertaken during the conflict. Ferdinand Arslanian is a PhD candidate in International Relations at the University of St Andrews, Centre for Syrian Studies. 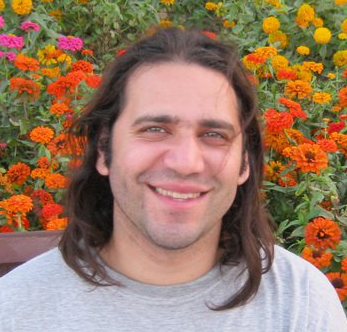 His thesis focuses on how Syria has managed to cope with economic sanctions. He holds an MSc in Economics from the University of Kent at Canterbury and has previous professional experience in Syria as a public policy advisor with the German International Cooperation (GIZ). Arslanian has authored the following publications: ‘Growth in Transition and Syria’s Economic Performance’ (Syria Studies, 2009), ‘The Civil War in Syria: The International Dimension’ (Global Policy, 2015) and the book review ‘Mohammed Imady, The Evolving Concepts of Development in Syria’ (Syria Studies, 2015). He is also a recipient of the Calouste Gulbenkian Global Excellence Scholarship and would like to acknowledge the Foundation’s support in producing this article. The economic aspect of the Syrian conflict has been largely overshadowed by its more compelling humanitarian, military and political aspects. The economics of the Syrian conflict are reflected in many areas: as an underlying cause of the uprising in reference to the liberalization measures undertaken during the years of Bashar al-Asad; as a political tool employed by foreign adversaries given the imposed sanctions regime; and as one of the domains embodying the resilience of the Syrian regime. This essay will shed some light on the economic aspect of the Syrian conflict from the perspective of the Syrian regime. It will begin by providing background on the Syrian economy under Hafez al-Asad and the liberalization measures undertaken under Bashar. It will, then, address the impact of the conflict and its associated policies and conclude by highlighting the dynamics of the Syrian economy under a potential transition government. Syria’s statist economy was shaped by the prevailing political and economic factors in the aftermath of the 1967 defeat against Israel and Asad’s ascension to power. The Syrian army was devastated while the regime was isolated domestically and internationally given the radical stances of Asad’s predecessors. In response, Asad sought to reorient Syria’s foreign policy towards the sole objective of regaining the Golan Heights. This implied reconciliation with the oil-rich Arab Gulf monarchies while retaining relations with the Soviet Union, and rapprochement with the Syrian traditional bourgeoisie while retaining the party’s rural and plebeian social base. The economic repercussions of these developments was the channeling of financial aid received from oil-rich Gulf countries towards expanding the public sector which, in turn, acted as a means to employ the rural and plebeian social base of the Baath Party. Simultaneously, the traditional bourgeoisie was allowed to thrive on the margins of this process as it was allowed to import goods, act as an intermediary between the public sector and foreign companies as well as invest in light industries and services. By the late seventies, however, this economic system proved unsustainable as the inefficiencies of the public sector became apparent. Corruption was rampant and inflation began to affect the purchasing power of the average Syrian. This was followed by a dwindling of Gulf aid and revenue from oil exports throughout the first half of the 80s, leading to an acute foreign exchange crisis in 1986. To resolve this crisis, the government reduced its own economic role and relied on the private sector for international trade and investment. Within a few years, the Syrian economy was back on track with the resurgence of oil exports and the private sector. A new economic system emerged, dubbed ʻEconomic Pluralismʼ (at-Taʻaddudiyyah al-Iqtisadiyyah), which elevated the private sector to be on par with the public sector. The early nineties witnessed a private sector-led boom which was inward looking, consumer product-oriented and highly protected from external competition. Nevertheless, the boom was soon exhausted with a halt in further economic reforms leading to a recession in 1999. It was under these dire economic conditions that Bashar inherited Syria in 2000. Initially, he attempted to reorient the economy westwards, mainly through negotiating the European Union Association Agreement (EEAA), while setting the legal foundation for a business-friendly economy in what was called ‘the Decree Revolution’ (Thawrat al-Marasim). In the meantime, the Iraqi market served as an economic lifeline providing an outlet for Syria’s manufactures and, more importantly, through reselling sanctioned Iraqi oil; this resulted in the substantial accumulation of foreign exchange reserves. However, the hawkish Bush administration intervened to halt plans to integrate into the international economy. The mounting political pressure was first met by the attempt to accelerate the EEAA agreement. As a prelude for the agreement, unilateral steps towards trade liberalization were undertaken in 2004 through reducing tariff rates, relaxing other import restrictions and unifying Syria's multiple foreign exchange rates. Similarly, subsidies were slashed and prices liberalized, as priority was given to balancing the public budget. However, this attempt was brought to a halt with the Hariri affair in early 2005. In response, the Syrian economy leaned eastwards exploiting the post-Iraq invasion oil boom and attracting Gulf investments. Consequently, a service-led boom erupted with the liberalization of the financial sector and concentration of Gulf investments on high-end real estate and tourism projects. Officially, this new era was dubbed as ʻthe Social Market Economyʼ (Iqtisad as-Suq al-Ijtimaʻiyy). In the late aughts, the Syrian economy was back on track with an average annual growth rate of 4.7% albeit at the expense of a growing disparity between rich and poor. A new service-based economy emerged while traditional artisan manufacturing was devastated by foreign competition. Crony capitalists had extended their grip on the economy while the former rural base of the regime had grown increasingly alienated. Nonetheless, it is important to note that at the end of the day Syria’s liberalization measures were half-hearted. The public sector remained intact, employing a significant percentage of the workforce. Subsidies still existed for many essential items such as bread, utilities and energy products. Despite shifting eastwards, the Syrian economy was still heavily dependent on the EU for essential imports and oil exports. 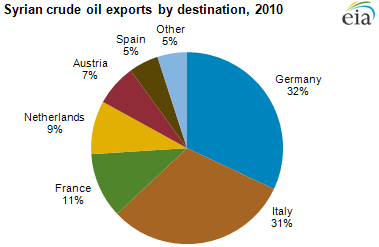 [Image: Syria crude oil exports by destination, 2010. Over 90% of Syrian crude oil exports used to go to European countries (US Energy Information Administration/Syria Country Analysis Brief/Fair use. All rights reserved to the author)]. Economically, not least, Syria is a different country after five years of conflict. Its income level has converged to that of a Sub-Saharan African economy, the Syrian currency has lost at least 85% of its value, and the manufacturing base has eroded. Syria’s trade structure has changed significantly with imports reduced to the essentials of oil products and food items not produced locally; exports dwindled to around 30% of its pre-conflict value while Iran has emerged as the country’s main trade partner. Yet Syrian officials have prided themselves for being able to avoid economic collapse despite five years of conflict and economic sanctions. Syria’s economic resilience is manifested through the survival of a largely functioning state, which continues to provide public services (including bread supplies), despite the deterioration of their geographical outreach and quality. Unlike neighboring and relatively stable Lebanon, Syria has not faced a ‘garbage crisis’ and still manages waste quite effectively. The country has also avoided defaulting on state salaries, and a collapse in the financial system. At the onset of the uprising, the immediate economic impact was due to a loss of revenue from tourism in addition to the general standstill in economic activity, commonly associated with such political situations. In response, economic policy was guided by two political considerations: maintaining normalcy -- the ‘Syria is fine’ (Suria bi-kheyr) mentality -- and creating anti-uprising alliances or, at least, neutralizing social groups. The ‘Syria is fine’ mentality implied maintaining economic indicators such as avoiding the depreciation of the Syrian Pound (SYP) and averting a run on banks, while limiting measures that would indicate economic tightening (such as restrictions on foreign exchange transactions). Thus, Syria’s monetary and foreign exchange policy combined high interest rates, and unofficial market intervention by relying on a group of well-connected Syrian businessmen dubbed as ʻthe Syrian Economic Armyʼ (al-Jaysh al-Iqtisadiyy al Suri). As for the second consideration, it politically entailed neutralizing the Kurds through the granting of citizenship to those who’ve been deprived from it and appeasing the Damascene Islamic clergy by closing the Damascus casino and launching a religious TV channel. Economically, it meant falling back on the public sector client base through increasing salaries and employment. However, with the EU oil trade ban in September 2011, Syria lost its main source of revenue and adjustments had to be made to its previous economic policy. The first attempt was to impose a harsh import ban on all goods subjected to a customs tariff higher than 5%, which the government was forced to revoke under the pressure of businessmen. This confirmed the difficulty of reverting the liberalization process as well as the political power of the Syrian business class. Therefore, the pressure on the Syrian Pound had to be accommodated by allowing the currency to depreciate and intervening officially in the market at the expense of foreign exchange reserves. In terms of public finance, the investment expenditure was scrapped in order to maintain the current expenditure of salaries and subsidies. With sanctions extending to the financial sector, many countermeasures were undertaken to circumvent them. There was an increasing reliance on the Russian financial system, on Iranian expertise in illicit oil shipping, and the establishment of offshore companies in Lebanon and worldwide. The escalation of the Syrian crisis towards a full-scale civil war by the summer of 2012 resulted in the contraction of areas under government control and the fragmentation of the country among different warring factions. Economically, this implied a dramatic reduction in the country’s capital stock through destruction, flight and idleness, as well as the contraction of international trade to a mere fraction of its pre-uprising level. The government lost control of most of its border posts and oil fields and, in general, faced increasing difficulty in linking areas of agricultural production with urban consumption sites. The end result was increasing shortages, power outages and skyrocketing inflation. Furthermore, Syria witnessed the rise of war economics in which looting, abduction and economic deals between warring factions became common business practices. However, the turn in the military tide in favor of the Syrian army by summer 2013 was accompanied by economic developments. First, Iran provided its second credit line worth $3.6 billion to facilitate imports following its first line of $1 billion provided in January 2013. Then, there was a change in Syrian trade policy towards more restrictive import measures. Import licenses were reintroduced for private importers on a case-by-case basis. The Iranian credit lines facilitated the return of the government as an importer of key food commodities. Procuring foreign exchange at the official rate became restricted to government transactions while the private sector had to procure its own foreign exchange at the market price. Finally, the Syrian economy began to adapt with the new situation, especially fall 2013, following the Ghutah chemical attack. Government-controlled areas became better linked as the so-called ‘useful Syria’ emerged, linking the coast with Damascus and Syria’s centre with Aleppo. Businesses relocated from war-torn rural Damascus to the capital and from Aleppo to the coastal region, while new businesses started to emerge in safer Sweida and Hama. And even though a manifold of businesses fled to Turkey, Egypt, Jordan and UAE, many of them were designed to serve the Syrian market, thus creating complex commercial networks. Furthermore, remittances from the Syrian diaspora helped many Syrian families sustain their livelihoods. The confluence of all these factors facilitated the relative stability in the exchange rate and prices as well as stabilized the decline in economic output. However, by mid-2014, the Syrian regime was facing increasing hardships in renewing credit lines as its two major allies, Russia and Iran, were suffering their own financial difficulties due to lower oil prices and economic sanctions. Left to their domestic resources, the Syrian authorities developed the concept of ‘subsidy rationalization’ (‘aqlanat ad-daʻm). Envisioned as better targeting subsidies to reach those in most need, its actual implementation was manifested through curtailing subsidies on essential products while increasing salaries in the public sector. In this regard, several rounds of price increases were carried out on essential products including energy products, utilities, sugar and even bread. The economic situation heavily pressured the Syrian Pound which continued to depreciate, especially with the fall of the city of Idlib in March 2015. As a result, the government began tightening foreign exchange depletion by reducing import funding to essentials and obliging exporters to sell foreign exchange earnings to the Central Bank. In order to raise revenue, the authorities abandoned their previous punitive tactic of refusing passport renewals for opposition sympathizers and doubled counselor fees, raising around $500 million. These measures allowed the Syrian Pound to hover around 300 SYP per Dollar throughout the summer of 2015. However, the Syrian currency started to depreciate dramatically in August 2015. The procurement of the $1 billion third Iranian credit line did not manage to reverse the trend. 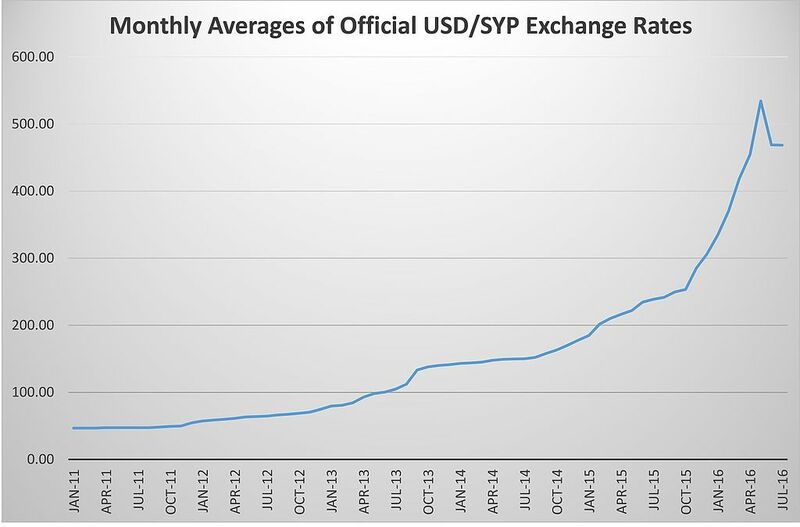 [Image: Monthly averages of official USD/SYP exchange rates from January 2011 to July 2016 - 7-9-2016 (Syrian Central Bank Archive of Official Exchange Rates/Aladdin/Public Domain)]. The Russian intervention in September 2015 brought new hopes to the Syrian economy. The Russian export and import village, a storage facility based in Latakia’s port supported by bi-weekly shipments to Russia, was established with the aim of increasing Syrian agricultural exports. With the launch of the Geneva 3 peace talks in late 2015 and early 2016, and in preparation for the future reconstruction drive, new laws were enacted to regulate Public Private Partnership projects in infrastructure, establishing the Syrian Metals and Steel Council and a credit guarantee institution. The prime minister even announced the launch of a new phase in the Syrian economy termed ‘National Partnership’ (ash-Sharakah al-Wataniyyah) to replace the ‘Social Market Economy’. The new phase implied more involvement of the private sector in rebuilding the country’s infrastructure and thus represented a further step towards liberalization. Nevertheless, with the stumbling of the peace process, this new phase was rendered obsolete and the main focus of the Syrian economic policy was redirected towards stymieing the dramatic depreciation in the value of the Syrian Pound (more than 600 SYP per Dollar in May 2016). Consequently, the government introduced restrictions on import licenses and liquidity supply in the market. Overall, Syria’s economic resilience can be attributed to three factors: its former economic measures, the role of political allies and the economic measures undertaken during the conflict. The relative importance of these factors is not static and has changed within the course of the conflict. The economic measures undertaken throughout the decades to insulate the Syrian economy from political pressure included accumulating massive foreign exchange reserves, policies of self-sufficiency in agriculture and an illicit financial network. These measures helped the Syrian economy survive the initial pressures in 2011. Nevertheless, with the increasing burden of economic sanctions and the repercussions of the conflict, the role of political allies, especially the Iranian credit lines, became vital for the survival of the Syrian economy. With the later decline in external support, new economic measures were implemented, combining restrictions in trade and foreign exchange with price liberalization, while maintaining public salaries. The sustainability of these measures ought to be questioned as Syria is facing difficulties in procuring public revenue to fund its expenditure and finding export markets to finance its import bill. So far, the Russian village has not met expectations, investment failed to kick off following the economic adaptation in mid-2013, and increasing trade restrictions to save the currency have encouraged smuggling given that the Syrian government no longer controls its Turkish border. These difficulties are manifested in the country’s increasing budget and trade deficits and increasing public debt level. In general, it is important to note that the Arab Spring failed to yield a new economic paradigm. This is best exemplified by the fact that both Egypt and Tunisia have lately resorted to IMF loans. As such, neoliberalism -- despite all its critics -- remains the dominant economic philosophy both internationally and regionally. As for Syria, it is important to note that there is no local Syrian stakeholder that is interested in reversing the trend of liberalization. If the Syrian regime became neo-liberal by necessity, the opposition's Syrian National Coalition is neo-liberal by choice. Not to mention that the amount of devastation the Syrian economy has suffered makes it near impossible to create a sustainable welfare system. The political settlement in Syria remains vague given the complexity of its conditions, timing and inclusiveness. Nevertheless, for the purpose of this analysis, the transitional government could be viewed as a continuum where in one extreme end we have the regime’s vision of an extended unity government with no change in its political structure whereas, on the other end, the opposition-led transitional government begins with the ousting of Asad followed by the dismantling of the security state. The position of the transitional government along the continuum is not static, but different types of pressure could be exercised in order to coerce the Syrian regime to yield more concessions. Western economic leverage can be regarded as one type of pressure; in this sense, the more the Syrian regime concedes to the Syrian opposition within the transitional government the more sanctions would be lifted and reconstruction funds would be provided. As a preemptive measure, the Syrian regime could attempt to circumvent such pressure through designing the reconstruction process as commercially viable. In one of Bashar’s interviews, he portrays the reconstruction process as rewarding to political allies - namely Russia, China and Iran - and expects adversarial countries to urge their companies to join the process. [Image: Reconstruction plan of the Baba Amr area in Homs - 25-8-2015 (Homs Governorate official website/Fair use. All rights reserved to the author)]. The implicit assumption of this logic is that economic liberalization must take place, in order to attain such a profit-generating reconstruction. This is evident from the laws enacted in this regard during the Geneva 3 peace talks. Given that the amount of devastation might not facilitate a profit-driven reconstruction, the Syrian economy may have to be content with a gradual and partial re-construction process, if it seeks to avoid political concessions. A similar logic applies to the process of lifting economic sanctions. Whereas Western powers will use sanctions as a tool for extracting concessions, the Syrian response could be to further reorient trade away from the West. This option is manageable given the country’s low technological base as well as the emergence of other economic powers. To conclude, Syria’s economic policy tends to be subordinate to the achievement of political objectives. Maintaining the ancien régime could act as the prime political objective during a transitional phase, which would imply encouraging commercially-motivated investment and trade with allies to mitigate politically-conditioned reconstruction funding. [Main image: Old version of the Syrian 1000 banknote - 27-7-1998 (Belson 303/CC BY.SA 4.0)]. Hinnebusch, Raymond A. Authoritarian Power And State Formation In Ba'thist Syria (1st ed. Boulder, Colo.: Westview Press, 1990), 143. Hinnebusch, Raymond A. "Syrian Policy in Lebanon and the Palestinians." Arab Studies Quarterly (1986): 2. Hinnebusch, Raymond A. Authoritarian Power And State Formation In Ba'thist Syria. (1st ed. Boulder, Colo.: Westview Press, 1990), 144. Perthes, Volker. The political economy of Syria under Asad. (Ib Tauris, 1997), 42-43. Hinnebusch, Raymond A. "The political economy of economic liberalization in Syria." International Journal of Middle East Studies 27, no. 03 (1995): 311. Perthes, Volker. "Stages of economic and political liberalization." Contemporary Syria: Liberalization between Cold War and Cold Peace (1994): 46-48. Sukkar, Nabil. "The crisis of 1986 and Syria’s plan for reform." Ed. Kienle Eberhard, Contemporary Syria-Liberalization Between Cold War and Cold Peace. (London. 1994): 27-28. Arslanian, Ferdinand. "Growth in Transition and Syria’s Economic Performance." Syria’s Economy and the Transition Paradigm (2009): 46-47. Hinnebusch, Raymond. "Globalization and generational change: Syrian foreign policy between regional conflict and European partnership." The Review of International Affairs 3, no. 2 (2003): 203. Barout, M. Jamal. "The past decade in Syria: the dialectic of stagnation and reform." Doha: Arab Center for Research and Policy Studies (2011): 56. Hinnebusch, Raymond. "Globalization and generational change: Syrian foreign policy between regional conflict and European partnership." The Review of International Affairs 3, no. 2 (2003): 200-201. Hinnebusch, Raymond. "Syrian foreign policy under Bashar al-Asad." Ortadoğu Etütleri 1, no. 1 (2009): 12. Haddad, Bassam. "Syria's curious dilemma." Middle East Report 236 (2005): 4-13. Accessed December 12, 2016, https://goo.gl/ZiGBQ2. Said, Salam. “The Effect of Trade Liberalization on Syrian Industry: The Cases of the Textile and Olive Oil Industries." Syrian Foreign Trade and Economic Reform (2010): 50. Abboud, Samer. "The Transition Paradigm and the Case of Syria." Syria's Economy and the Transition Paradigm (2009): 16. Haddad, Bassam. "Syria's curious dilemma." Barout, M. Jamal. "The past decade in Syria: the dialectic of stagnation and reform." Doha: Arab Center for Research and Policy Studies (2011): 57. Calculated from IMF GDP growth figures based on the IMF Syria Country Report. No. 10/86 (2010): 17. Barout, M. Jamal. "The past decade in Syria: the dialectic of stagnation and reform." Doha: Arab Center for Research and Policy Studies (2011): 315. Abboud, Samer. "The Transition Paradigm and the Case of Syria." Syria's Economy and the Transition Paradigm (2009): 11. Syria’s GDP per capita would be $ 777 per annum, given that the IMF estimated the Syrian GDP to be $14 billion and divided by the estimated population of 18 million, which is comparable with that of Sub-Saharan African countries such as Mali ($732) and Rwanda ($802). Gobat, Jeanne, and Kristina, Kostial. "Syria's Conflict Economy." International Monetary Fund (2016): 16. See al-Mayadeen TV’s interview with former Governor of the Central Bank of Syria, Adeeb Mayaleh. December 25, 2013. Accessed December 12, 2016. https://goo.gl/dDCpbN. and the Syrian TV’s interview with former Minister of Economy and External Trade, Humam al-Jazairy. February 1, 2016. Accessed December 12, 2016. https://goo.gl/5nmgSz. The Syria Report. “Central Bank Announces Measures to Rein in Run on Syrian Pound.” May 02, 2011. Accessed December 12, 2016. http://www.syria-report.com/news/finance/central-bank-announces-measures-rein-run-syrian-pound [subscription needed] - The Syria Report. “Central Bank Issues Rules Regulating the Purchase of Foreign Currencies.” August 1, 2011. Accessed December 12, 2016. http://www.syria-report.com/news/finance/central-bank-raises-deposit-rates-11-percent [subscription needed]. The Syria Report. “Central Bank Raises Rates, Reduces Compulsory Requirements.” May 5, 2011. Accessed December 12, 2016. http://www.syria-report.com/news/finance/central-bank-raises-rates-reduces-compulsory-requirements [subscription needed]. “‘The Syrian Economic Army’ pumps money to support the Syrian Pound, Rami Makhlouf: The Dollar will collapse in front of the lira” (in Arabic), Dam Press, July 2, 2011, accessed December 12, 2016. https://goo.gl/zd9j5F. Nasser, Ranie, Zachy Mehchy, and K. Abu Ismail. "Socioeconomic roots and impacts of the Syrian crisis." Syrian Centre for Policy Research. Damascus: Syrian Centre for Policy Research (2013): 34. Wehbe Mohammad. “Syria and Lebanon: Overlapping Crises” (in Arabic), Al-Akhbar, January 25, 2012. Accessed December 21, 2016. http://al-akhbar.com/node/33522. “Socioeconomic roots and impacts of the Syrian crisis.” Syrian Centre for Policy Research (2013): 44. The Syria Report. “Government Restricts Imports as Pressure Grows on Currency Holdings.” June 17, 2013. Accessed December 12, 2016. http://www.syria-report.com/news/economy/government-restricts-imports-pressure-grows-currency-holdings [subscription needed]. Bahah, Moudah. “Markets on Show in Damascus” (in Arabic), Al-Akhbar, August 12, 2013. Accessed December 12, 2016. https://goo.gl/tBKn6z. Khaddour, Kheder. “The Coast in Conflict Migration, Sectarianism, and Decentralization in Syria’s Latakia and Tartus Governorates.” Friedrich Ebert Stiftung (2016): 8. The Syria Report. 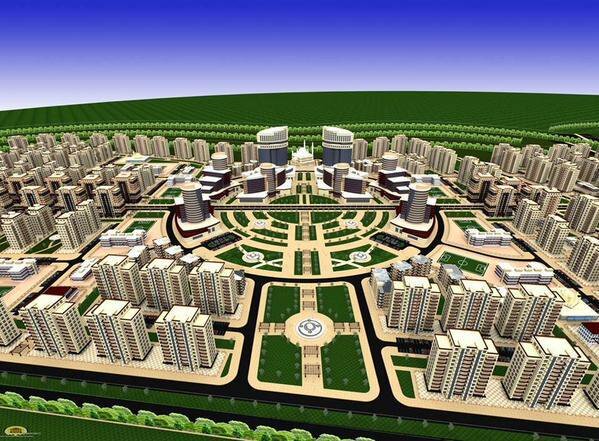 “Projects Licensed by Syrian Investment Body Focus on Manufacturing and Safe Areas” June 09, 2014. Accessed December 12, 2016. http://www.syria-report.com/news/economy/projects-licensed-syrian-investment-body-focus-manufacturing-and-safe-areas [subscription needed]. Abboud, S. "Syria’s Business Elite: Between Political Alignment and Hedging Their Bets." Stiftung Wissenschaft und Politik, German Institute for International and Security Affairs (2013): 5. “Syria's political situation forcing businesses to leave.” BBC. September 7, 2013. Accessed December 12, 2016. https://goo.gl/xmc2QE - Sahoo, Sananda.“Syria's exiled entrepreneurs are hanging tough in the UAE” The National. May 27, 2013 Accessed December 12, 2016. https://goo.gl/fljcpQ . “Syria: Confronting Fragmentation! Impact of Syrian Crisis Report” Syria Center for Policy Research, (2016): 24. “Syria: Alienation and Violence. Impact of Syria Crisis Report 2014” Syria Center for Policy Research (2015): 33. “Syria: Squandering Humanity Socioeconomic Monitoring Report on Syria. Combined third and fourth quarter report (July – December 2013)” Syria Center for Policy Research, (2004): 32. The Syria Report. “Syria Prioritises Import of Food Products” May 18, 2015. Accessed December 12, 2016. http://www.syria-report.com/news/economy/syria-prioritises-import-food-products – The Syria Report “Dollar Reaches 280 pound Level” April 13, 2015. Accessed December 12, 2016. http://www.syria-report.com/news/finance/dollar-reaches-280-pound-level [subscription needed]. The Syria Report. “Passports, a main Source of Foreign Currency Revenues for the Syrian Government” October 26, 2015. Accessed December 12, 2016. http://www.syria-report.com/news/economy/passports-main-source-foreign-currency-revenues-syrian-government-%E2%80%93-report [subscription needed]. The Syria Report. “Syrian Pound Loses Ground to Dollar” August 17, 2015. Accessed December 12, 2016. http://www.syria-report.com/news/finance/syrian-pound-loses-ground-dollar [subscription needed]. The Syria Report. “Dollar Rises Again in Syrian Forex Market” August 08, 2015. Accessed December 12, 2016. http://www.syria-report.com/news/finance/dollar-rises-again-syrian-forex-market – The Syria Report. “Dollar Crosses 330 Pound Level for First Time on Record” September 14, 2015. Accessed December 12, 2016. http://www.syria-report.com/news/finance/dollar-crosses-330-pound-level-first-time-record [subscription needed]. “The State of the Syrian Economy at the End of 2015” The Syrian Consulting Bureau for Development and Investment. (2015): 3. Accessed December 12, 2016 https://goo.gl/vqNZ37. The Syria Report. “Why is the Syrian Government Rushing to Impose New Business Laws?” January 11, 2016. Accessed December 12, 2016. http://www.syria-report.com/news/economy/why-syrian-government-rushing-impose-new-business-laws - The Syria Report. “Government Establishes Credit Guarantee Corporation” March 29, 2016. Accessed December 12, 2016. http://www.syria-report.com/news/finance/government-establishes-credit-guarantee-corporation [subscription needed]. The Syria Report. “Four Main Factors behind the Recent Rise of the Dollar in the Syrian Forex Market.” May 10, 2016. Accessed December 12, 2016. http://www.syria-report.com/news/finance/four-main-factors-behind-recent-rise-dollar-syrian-forex-market [subscription needed]. The Syria Report. “Cash Shortage Strengthens Syrian Pound, Increases Speculators’ Profits and Erodes Confidence in Central Bank.” June 07, 2016. Accessed December 12, 2016. http://www.syria-report.com/news/finance/cash-shortage-strengthens-syrian-pound-increases-speculators%E2%80%99-profits-and-erodes-confid - The Syria Report. “Syria’s Imports Fall by Half, Reducing Pressure on Currency Reserves – Government.” July 12, 2016. Accessed December 12, 2016. http://www.syria-report.com/news/economy/syria%E2%80%99s-imports-fall-half-reducing-pressure-currency-reserves-%E2%80%93-government [subscription needed]. Gobat, Jeanne, and Kristina Kostial. "Syria's Conflict Economy." (2016): 13-17. For an outline of the opposition’s economic vision see Syrian Center for Political and Strategic Studies & Syrian Expert House. “Syria Transition Road Map” 2013: 203-207. For a critique of the opposition’s economic vision see Matar, Linda. “The Political Economy of Investment in Syria.” Palgrave Macmillan UK, (2016): 145.